Okay Yasiel…you’re not fooling anybody. You have wrongly deceived the baseball nation. Time to take off the makeup, step out of the human body, and expose the robot underneath. I admit, you had me fooled initially, but now its just getting ridiculous. Nobody arrives in the Big Leagues and records 34 hits and seven homeruns in their first 20 games. Nobody arrives in the Big Leagues and records 44 hits in their first full month (exception, Joe DiMaggio). And nobody wins NL Rookie of the Month Award and NL Player of the Month Award in their first month in the majors. Well nobody accomplished those feats, until a hot hitting sensation from Cuba by the name of Yasiel Puig suited up for the Dodgers. What Puig has done in the big leagues is incomprehensible. I believe Vin Scully summed it up best when he said “……….” Oh, that’s right! Puig left Vin Scully speechless. Los Angeles hasn’t seen this much excitement since Pink’s Hot Dogs debuted in 1939. Aside from Puig’s out-of-this-world play, he has revitalized a slumping Dodgers organization. To put things into perspective, the Dodgers ended the month of May (pre-Puig) in last place in the NL West. Currently, after the arrival of Puig, they are in 2nd place in the NL West. In just 5 weeks, Puig single-handedly turned this organization around. Puig is batting .407 through 135 at-bats. There is no other Dodger (with at-least 130 at-bats) batting over .300. I was blessed to witness many of Puig’s games during his historic month of June. I haven’t seen this much hysteria at Dodger Stadium since the arrival of MannyWood. I was sitting right behind the visiting team dugout (Atlanta Braves) on June 6th when Puig came to bat with the bases loaded. Everyone in the stadium stood to their feet in anticipation of what he might do. On the first pitch he saw, he connected and sent it over the right field fence for a gram slam. I was screaming like a girl at a Justin Beiber concert. But that’s the feeling you get when you witness greatness. I am appalled when I hear the constant debate of whether Puig should be considered for the All-Star game or not. Lets remember what the All-Star game is all about…the FANS! 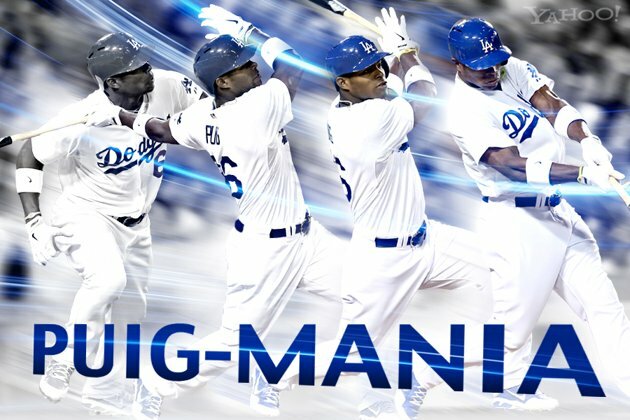 All Puig has done is captivate a nation of people with his unparalleled athleticism, showcase of power, and his unprecedented play in the month of June. Puig exemplifies everything that an All-Star should be. Outstanding player. Fan favorite. Exciting to watch. Thank you Yasiel Puig for ignited a fire in Los Angeles. Yes you can do it all. I wouldn’t be surprised if the Lakers gave you a call to revitalize their organization. That’s another story. You are now free to climb back in your human body, and continue leaving the world in awe of your amazing abilities. Sorry Lincecum, but there’s a new freak in baseball!